This romantic piece nods to the English gardens in bloom and afternoon tea with the ladies, a gorgeous tulle skirt with laser cut ruffles and floral details created by the 4 Moncler Simon Rocha line, collection n°4 of the Moncler Genius project. 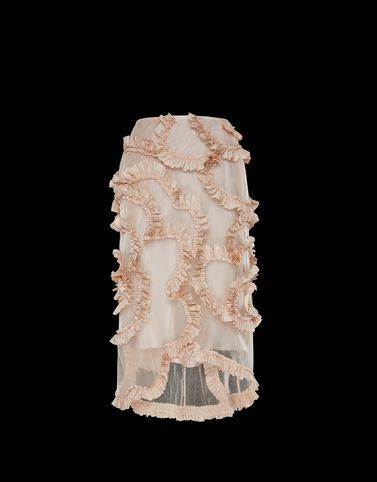 The transparency is muted by the slip while the delicate movement of the fabric highlights its elegance. For a woman who wants to be admired for all of her style. PART A: Do not wash; Do not bleach; Do not tumble dry; Ironing maximum temperature 110°C - without steam; Dry cleaning in tetrachloroethene - mild process; Do not professionally wet clean; Dry flat; Wash separately; It is advisable to wash and iron with the garment on reverse. ;PART B: Do not wash; Do not bleach; Do not tumble dry; Ironing maximum temperature 110°C - without steam; Dry cleaning in tetrachloroethene - mild process; Do not professionally wet clean; Dry flat; Wash separately; It is advisable to wash and iron with the garment on reverse.